An Aberdeenshire town was awash with colour yesterday afternoon as locals joined millions of people across the world to celebrate an ancient Hindi festival. 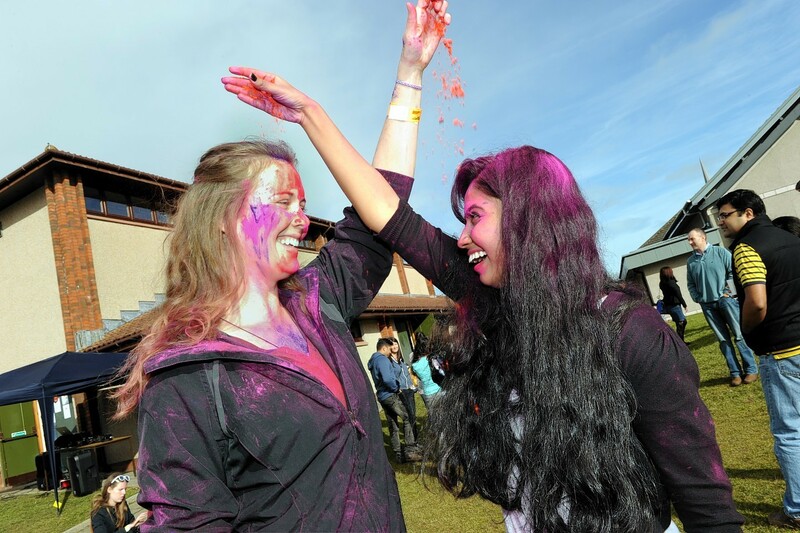 Westhill’s Ashdale Hall was the setting for the Holi event – which involved people painting each other with bright powers during a day of music and dance. Bucket loads of Gulal – the sand-based substance used during the festivities – were sent billowing into the sky as the north-east embraced the spirit of India’s second largest festival. It was in the biggest ever version of the event to be held in the region, attracting an estimated 700 people. Most major cities across the world now mark Holi – the festival of colours – in some form. The festival celebrates the victory of good over evil and the Hindi god Vishnu’s defeat of the demon Holika, and also heralds in the spring. The event was organised by the Indian Association of North East Scotland, who welcomed locals of all ages and backgrounds to the festival. The association’s secretary, Surendra Khandelwal, said: “It went as we expected, the weather stayed put and it was bright and sunny. This time a lot of people joined in and we had a very good reception. “It was very, very nice seeing how people participated in the whole thing. “They stayed, they danced and it was fun, it was nice to see everyone was really happy about it. “The food bit was the attraction for everybody. Normally this kind of food is only available in a restaurant. It pretty much sold out. A Bollywood DJ was on hand to provide music, while one of the biggest attractions was a stall where people could change into traditional Indian dress and have their pictures taken. Mr Khandelwal, who moved to the UK from the Indian state of Rajasthan in 2008 and now lives at Kingswells, added: “Big city centres are used to this kind of thing, like London.